It's become a popular rehab activities for runners. It's name: aqua jogging. Some use it as a means of "cross-training". Articles rave about it. Aqua jogging - otherwise known as "deep water running" - or how to become a better runner on the moon. You think I am joking? Let's look at the "evidence" and draw some conclusions. One of the primary perceived benefits of aqua jogging is that it allows you to maintain your aerobic capacity while injured. Yes, there is some truth to this. Yes, deep water running does provide a good aerobic training session - at least in the most basic terms. Of course, this would assume that losing your aerobic capacity for running is of primary concern while injured. If you look at the science behind it, you would have to have about 4 weeks of inactivity to lose your aerobic capacity. You can maintain this in many ways - without putting on an aqua jogging vest. Running in water amounts to being weightless. Astronauts train in water because it mimics the effects of space flight. It provides the sense of weightlessness found with a decrease in gravitational forces in space. 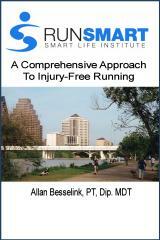 The problem is, running injuries are typically an issue of weight-bearing. They typically involve the body's inability to withstand loading, both during acceleration and deceleration of the body weight in stance. By training in the water, we are effectively allowing the body to ... well, to get really good at running in a weightless environment - or, as I always say, running on the moon. You see, the effect of running in water is dependent upon the depth of the water you're running in. If you are submerged up to your shoulders, you are unloaded by 90%, thereby loading the body with 10% of your body weight. On the moon, gravity is one sixth that of on earth - or 17%. Water running is even less than working out on the moon!! People speak of the increased density of water, and thus an increase in resistance in moving through it. Yes, there is an increase in density - and thus an applied resistance to the limbs with movement. This would strengthen the muscle tissues but again, in a non-weight-bearing environment. Again, if running injuries are problems of weight-bearing, I fail to see the benefit of this practice unless the client is unable to bear weight at all (which, in many if not most cases, is a very short period of time after even a significant injury). Let's face it - most running injuries will come in to the clinic fully (or at least partially) weight-bearing - it is only with the initiation of eccentric loading (i.e. with running) that the symptoms are produced.